Wondering how fast your internet connection really is? You'll need to test your internet speed to find out. There are plenty of ways to do this, some more accurate than others, depending on why you're testing. One common reason to test your internet speed is to make sure that you're getting whatever Mbps or Gbps level bandwidth you're paying your ISP for. If your tests show a regularly sluggish connection, your ISP may have an issue and you may have a refund in your future. Another reason to test your internet speed is to make sure you'll be able to stream high-bandwidth movies, like those from Netflix, Hulu, Amazon, and other providers. If your internet speed is too slow, you'll get choppy video or regular buffering. Free benchmark tools, like those popular internet speed tests and bandwidth testing smartphone apps, are the two most common ways to test your high-speed internet but there are others, like service-specific tests, ping and latency tests, DNS speed tests, and more. You suspect that your Internet Service Provider or wireless provider isn't giving you the bandwidth you're paying for, either on purpose or because something is wrong. You're very happy (or very sad) with the state of your high-speed internet and you want to tell the world about it! You want to check the internet speed between your device and a service you're paying for, like Netflix, HBO GO, etc. Just scroll down until you find the section that you're after. Choosing the right way to test your internet speed is the first, and easiest, step to make sure the results are as accurate as possible. Are most web pages taking forever to load? Are those cat videos buffering so much that you can't even enjoy them? If so, especially if this is new behavior, then it's definitely time to check your internet speed. Locate your ISP's official internet speed test page from our ISP-Hosted Internet Speed Tests page. We have almost every major US and Canadian ISP speed test page listed but we may be missing smaller providers. Let me know if your isn't listed and I'll dig it up. Close any other apps, windows, programs, etc. that might be using your internet connection. If you're at home, where other devices might be using the same connection, disconnect those or turn those off before beginning the test. See 5 Rules for a More Accurate Internet Speed Test for more advice. Follow whatever instructions you're given on screen to test your internet speed. A number of ISPs use Flash-based internet speed tests even though most devices, and more and more browsers, do not support Flash. Choose a non-ISP-hosted test if you have to but know that your Internet Service Provider might not give as much credit to those results. See HTML5 vs Flash Internet Speed Tests: Which Is Better? for more on this. Log the results of the speed test. Most internet speed tests let you save an image of the results and some provide a URL you can copy to reach the results page again later, but if not, just take a screenshot. Name the screenshot with the date and time you took the test so it's easy to identify later. For the best results, if your schedule permits, test your internet speed once in the morning, once in the afternoon, and once in the evening, over the course of several days. If you find that your internet speed is consistently slower than you're paying for, it's time to take this data to your Internet Service Provider and ask for service to improve your connection. Bandwidth that varies a lot at different times per day, sometimes meeting or exceeding what you're paying for, may have more to do with bandwidth throttling or capacity issues with your ISP than an actual problem. Regardless, it might be time to negotiate the price of your high-speed plan or get a discount on an upgrade. Choose a testing site from our List of Internet Speed Test Sites. Any one will do, even the ISP-hosted ones if you'd rather use one of those. SpeedOf.Me is one of my favorite speed test sites, doesn't require Flash, lets you share your results on social networks, and is probably more accurate, on average, than more popular tests like Speedtest.net. Follow whatever instructions you're given on screen to test your internet speed. Most broadband testing services, like both SpeedOf.Me and Speedtest.net, test both your upload and download bandwidth with a single click. Once the test is over, you'll be presented with some kind of test result and some method of sharing, usually via Facebook, Twitter, email, etc. You can often times save these image results to your own computer, too, which you can use to keep track of your internet speed over time. Some testing sites save your previous results for you automatically on their servers, too. Testing your internet speed and sharing the results is especially fun after upgrading. Be the envy of your friends and family everywhere with your 1,245 Mbps download speed you're getting on your new fiber connection! Curious if Netflix will work great at your home... or why it's suddenly not? Wondering if your internet connection will support streaming your favorite new shows on HBO GO, Hulu, or Amazon Prime Video? With so many streaming services, and each on a wide variety of devices, all of which are being constantly updated, it'd be impossible to give you simple speed test how-to that covers everything. A basic internet speed test is a good place to start. Even though it's not a true test between your connected television (or tablet, or Roku, or PC, etc.) and the Netflix or Hulu (or wherever) servers, any of the better internet speed test sites should give you a decent idea of what to expect. Check the device you're using for a built-in connection test. Most "smart" TVs and other dedicated streaming devices include built-in internet speed tests. These tests, usually located in the Network or Wireless menu areas, are going to be the most accurate way to figure out how much bandwidth is available for their apps. 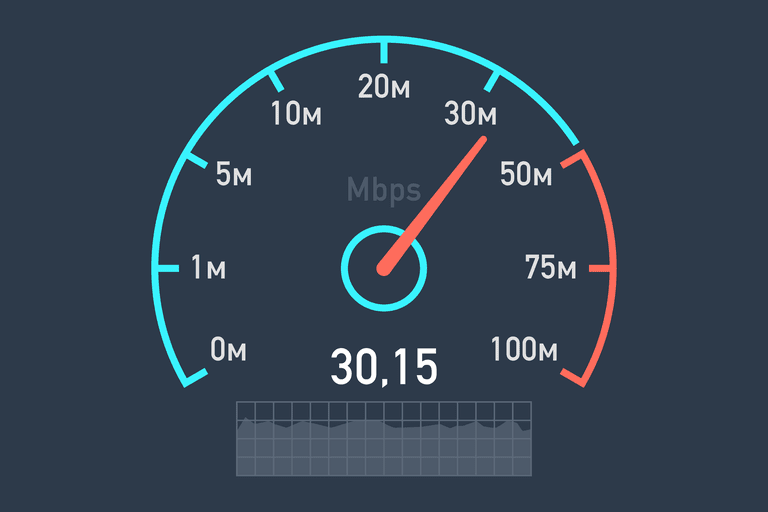 Netflix: Check out the Netflix ISP Speed Index report to see what to expect speed-wise, on average, from the various Internet Service Providers around the world or Fast.com to test your Netflix speed right now. Netflix's Internet Connection Speed Recommendations page suggests 5 Mbps for HD (1080p) streaming and 25 Mbps for 4K (2160p) streaming. If you're having trouble, it is possible to set the bandwidth Netflix uses in your account settings. Apple TV: While there's no built-in internet speed test available on Apple TV devices, Apple does offer extensive Apple playback performance troubleshooting via their help page. Apple recommends 8 Mbps for 1080p content and 2.5 Mbps for standard definition stuff. Hulu: There a General Troubleshooting Guide for Hulu Supported Devices should help solve why you might have a slow Hulu connection. Hulu suggests 13 Mbps for 4K Ultra streaming, 3 Mbps for HD, and 1.5 Mbps for SD. Amazon Prime Video: See the Video Issues page on Amazon's site for help that's specific to your device, like your computer, Amazon-branded tablets and devices, and other streaming hardware. Amazon recommends at least 3.5 Mbps for problem-free HD streaming and 900 Kbps for SD. HBO GO: The HBO GO Device Troubleshooting page should help you clear up any major problems. HBO suggests you test your internet speed with a 3rd party speed test to make sure you're getting the minimum download bandwidth of 3 Mbps they recommend for a buffer-free streaming experience.